Two-year-old Sasha is a long, lean, loving machine. This 45 lb. 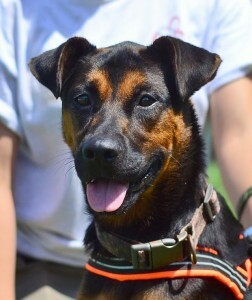 Shepherd mix is a bundle of fun energy who loves running and romping and would make a wonderful jogging and hiking buddy. Her best doggie friend, Monty, was just adopted and together they used to play chase until both were exhausted from … playing chase. Living with an active family would be the perfect fit for her and having a dog friend would just be the icing on the cake. Sasha’s zest for life is contagious and if you need a canine coach to help get you moving and active, she would love to be the one. Velvet could not be more appropriately named. 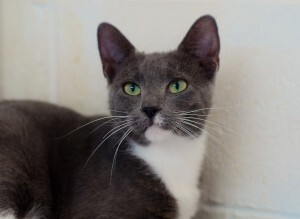 Her soft plush gray and white coat is a delight to the touch and her easygoing personality equally as capitivating. At two-years-old, this cool cat is a champion in the game of hide-and-seek. She camouflages herself in any setting and then takes great pleasure in watching we humans look for her. As if showing her seekers mercy, she will eventually reveal herself and parade along the floor meowing, “I was here all along!” Velvet gets along with other cats, dogs, and even kiddos. Adopt this lovely lady and add an casual elegance to your home.